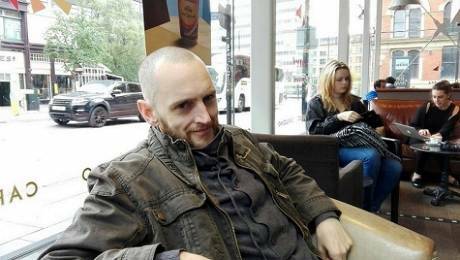 On July 14 this year a British man from the Manchester area named Benjamin Stimson, aged 41, a man the London Times called a “socialist” to add to his crimes, was convicted under the British Terrorism Act for “facilitating” acts of “terrorism” by serving with one of the Donbass Republic militias for four months in 2015, as an ambulance driver. Stimson was arrested in November 2015 immediately on his return to Britain and after having made the mistake of giving an interview to a BBC journalist about his role in the Donbass. He was remanded into custody and in July sentenced to over 5 years in prison. His crime? Simply telling the BBC that he was a “working class man with no work whose last job was on a zero hours contract” and that if attacked in the war he was willing to kill to defend himself. As the British prosecutor described the charges and facts to the judge the public had to wonder why Ben Stimson was sitting in the dock and not being feted around town because the prosecutor, apparently unaware that anything was amiss, portrayed a heroic figure, a real working class hero. “The defendant suggested that after watching reports in the media about far-right groups in Ukraine, he was inspired to join the rebels. He also complained of his lack of employment prospects back home. Instead of being feted by the public for volunteering to be an ambulance driver in relief of the besieged peoples of the Donbass under constant attack by the pro-fascist forces in Kiev he is being punished with imprisonment. He acted against the interests of the British NATO government and so was charged with a political crime, given a political trial, that is, no trial at all, and thrown into prison solely for political reasons. It appears that a guilty plea was extracted from him under duress by the Prosecution that threatened him with the more serious charge of engaging in preparation of terrorism that carries a life sentence upon conviction. His lawyer must have worked on him as well to plead guilty to a terrorism charge when he was guilty of nothing at all since he was never engaged in terrorism or with terrorists. He could have won a trial. Several defences were open to him that had a good chance of being successful if fully developed in a trial. The first is that he did not serve with any terrorists but with the legitimate armed forces of the Donbass republics defending themselves against the illegitimate pro-Nazi regime of Kiev, a regime that came to power through a violent putsch against the legitimate Yanukovich government in 2014, a putsch aided by the NATO powers including Britain. The Donbass Republics have duly constituted governments and properly organized armed forces with defined chains of command that engage in open military combat with the forces of the Kiev regime. The Donbass forces, whose actions are purely defensive to protect the people of their regions, do not attack civilians. The Donbass Republics are recognized in the Minsk Agreements as legitimate entities that are engaged in diplomacy with all the big powers. They are not “terrorist” organizations. They are committing no acts of terror. It is instead the Kiev forces that are engaged in acts of terror against the civilian population of the Donbass who are under constant bombardment and siege by them. The second is that the prosecution was selective since British mercenaries have served and are serving with Kiev militias in Ukraine and have returned to Britain without any repercussions. Several mercenary companies have men operating in Ukraine against the Donbass republics. Just on the 12th September the Donbass high command reported the presence in Krasnogorovka of a platoon strength unit of British mercenaries. Their presence is no secret as these men have given interviews to local TV and talk about their presence on social media but the British prosecution service turns a blind eye to their activities. The third defence is that the trial was a political one arranged to give legitimacy to the Kiev regime, to condemn Russia as the “aggressor,” and to cover the British support for fascism and a fascist regime in control of Kiev and the close cooperation between the British mercenaries working for Kiev and the British regular forces and government. The fourth is that his case was used by the British government as a device to prove that its anti-terror laws were not targeted at Muslims but can also be used against anyone fighting for a secular cause, so long as it is a cause that falls foul of the British elites. departments, marketing, and a public face as “risk management consultants” and “security consultants” to those operating in “high risk environments.” They make huge profits on wars from Afghanistan to Africa. So if you are an out of work lad in Manchester and you are looking for some pay and some adventure you can freely sign up to work for these companies, be sent to commit acts of terror against the people of the Donbass or the resource rich nations of Africa, or Syria, Iraq, Afghanistan, Libya, wherever the British government requires you. You will be handsomely paid and guaranteed a career. But if you want to defend people against these terrorists, you will be arrested on a trumped up charge and thrown into prison. “You ultimately did no physical harm to anyone but you assisted the militia by your presence and your involvement, and you will have given a lead to others.” Aye, there’s the rub. He gave a lead to others. He must be made an example of. The conviction also makes clear the NATO and Kiev regime policy towards the defenders of the Donbass. They are considered criminals not lawful combatants. Instead of the Geneva Conventions applying on capture, they will face criminal charges or perhaps be thrown into the black holes of the CIA and other western intelligence agencies. The NATO backed war in Ukraine against the peoples of the Donbass has thousands of victims. Now it has a victim in Britain, another political prisoner in a British jail. Ben Stimson is a man who should never have been charged, who was denied a fair trial, whose liberty must be restored. So long as liberty is denied him we can have none. So free Ben Stimson, to free us all.